Here it is: A vessel that can both crush through the ice and dive beneath it when working on extraction of mineral resources from the Arctic seabed. In 2017, President Vladimir Putin said large potentials for economic development is found offshore in the Arctic. The president was talking to the audience at the conference «Arctic - Territory of Dialogue» held in Arkhangelsk. At the same conference, another Russian submarine design bureau, Rubin, presented their version of civilian nuclear-powered submarines to work on mineral extraction in Arctic waters. A set of mini-submarines with lifting capacities powered by a new 24 MW reactor were presented. Based on the drawings from Malachite, the well known submarine expert H I Sutton, who runs the portal Covert Shores and has published sever books on submarines, has made a few illustration of how he believes the new Arctic shelf submarine would look like, both at the interior and the external body. 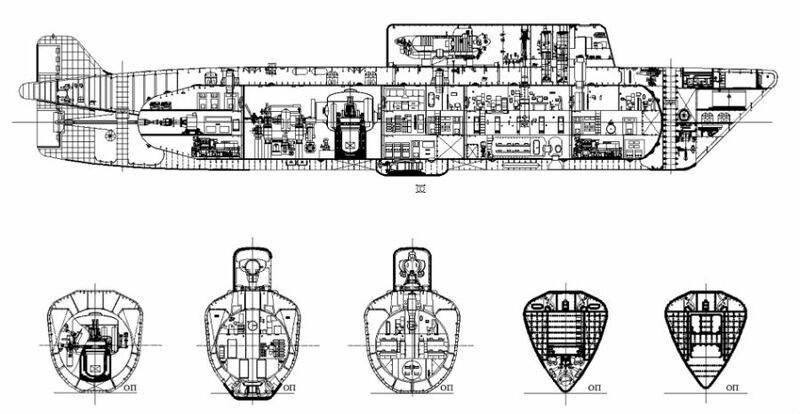 He describes how the large sail of the submarine includes an integral hangar for a docked dry submersible. There are three remotely operated vehicle (ROV) interfaces; one under the keel, one on the top of the bow and one in the port side. There is also a large grab-arm which fully retracts into the bow. Duration divers would be able to exit from the bottom of the submarine and are provided with an internal hyperbolic chamber for compression, living and decompression. Wo far, Russia has no offshore subsea oil and gas installation or other mineral mining activities on the shelf. In the European Arctic, the only operating offshore oil field is the Prilazlomnoye in the eastern Barents Sea, operated by a traditional above surface drilling platform, ice-strengthened though. Possible subsea operations in the Arctic involving these new nuclear-powered submarines would in any case be many years into the future.